The redesigned Chevrolet Camaro performance car will go on sale across Europe towards the end of this year, with prices in the UK starting from £35,320 for the coupe with manual transmission. Prices for the convertible with manual transmission in the UK start from £40,320, and UK customers can look forward to taking delivery of their new Camaro as of November 2013. The new Camaro represents the most significant redesign since the introduction of the fifth-generation Camaro as a concept car in 2006. It features a revised exterior appearance that integrates high-performance aerodynamics, allowing for more efficient cooling and stability at high speeds. The design changes give the Camaro a more contemporary look. The front fascia has a wider lower grille and a narrower upper grille, while the functional hood vent helps reduce heat and aerodynamic lift. At the rear, a sculptural deck lid, horizontal lamps and diffuser complete the facelift. 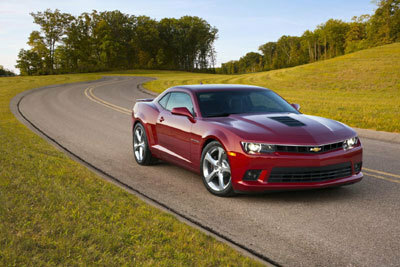 The Camaro's 6.2L engine produces 432 hp (318 kW) when coupled with a six-speed short-throw manual transmission, and 405 hp (298 kW) in combination with the automatic transmission, which has TAP shift functionality. Remote keyless entry is standard, and customers can opt for remote engine start functionality on the automatic variants. Founded in 1911 in Detroit, Chevrolet is the world's fourth largest car brand with annual sales of almost 5 million cars and trucks in more than 140 countries. Chevrolet provides customers with fuel-efficient vehicles that feature spirited performance, expressive design, high quality and Chevrolet MyLink intelligent connectivity. The UK Chevrolet line-up includes the Spark, Aveo, Cruze Saloon, Hatchback and Station Wagon, Orlando, Captiva, the legendary Camaro and Corvette sports cars and the extended-range Volt electric car. In 2013, Chevrolet is launching the all-new Trax small SUV and the all-new Corvette Stingray. More information on Chevrolet can be found at chevrolet.co.uk.